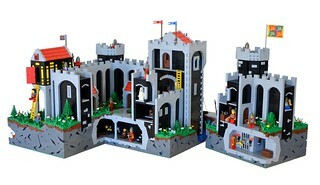 Classic-Castle.com • View topic - Have you ever? Have you ever taken on a large MOC, given it you all with the very best detail you could muster, ...only to find when you are nearly done that you are off by a single brick length in a key section that must be correct, yet requires major deconstruction to mend. (We're talking hundreds of pieces) Of course you could leave it be and claim creative liberty. Though you will always know it is wrong. ...and it looks wrong. Just wondering how many others can relate to this. ah ye.. not a lot of MOCin experience but it happens.. and I hate it when it does! so I always try and prevent it from happenin.. which means it takes me ages to start a new MOC: I look and look again at the empty base plate like a fool, then 'I lay down the stones' by just addin the bricks that will mark the corners :p what will happen on higher floors, though, can't quite tell in advance.. ! I like the "rebuilding" term. I always just called it tearing apart and starting over on that section. It does depend on the MOC though. I have used mistakes to create rougher/natural/decaying vibes before. I have began to accept that I will never get away from "rebuilding". It seems to be the only way to get a great detailed MOC that I can actually be somewhat happy with. Of course more pre-build planning would probably help too, but this is sorta my artistic medium. "If at first you don't succeed, cry, cry again." Every single build works like this for me. Nothing starts and just is built from the bottom up. I'm always tearing down, rebuilding, adjusting, doing math to fix it and starting over again. That's the fun and beauty of it all. I sometimes like to revisit a build I did and re-imagine it later..making it bigger, and better.